Week two took it's toll on a number of players and the waiver wire was buzzing with activity. Running Backs were drawing the most attention across the league but for me there was one other position that had to be addressed. So, let's get down to it! I coveted Walford in the draft, but when he was picked before I got the chance to draft him I switched to my backup plan, Travis Benjamin. As things have played out I guess it was a blessing in disguise, Benjamin looks to be a big part of the Chargers offence for the rest of the season and I was able to pick up Walford on waivers. He is drawing a decent amount of targets from Derek Carr and that should continue in week three versus the Titans. Sorry Gary but it looks like your time here is done, I blame Hue Jackson. Up in Cleveland it seems that Jackson wants to go against the logic used by the rest of the league and only view the TE position as an additional lineman. 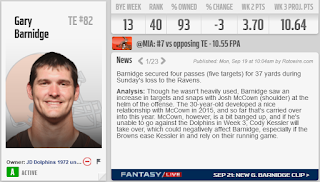 With everything falling apart against Baltimore you could have expected one of the top targets from last year to become a bigger part of the offence, but Barnidge had little to no impact on the game for the second week running. This is not a case of a QB having a preferred target, both RG3 and McC(l)own underutilised Barnidge and that has to come down to the coach. Week 3 sees QB number 3 start for the Browns and it just doesn't make sense to keep holding out false hope for Barnidge to break out. 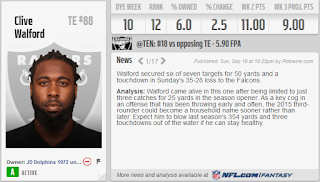 If things do pick up then there is no doubt that he will still be available on the waiver wire in later weeks. This pick up was more a case of preparing for future weeks rather than picking up a player to start this week. Green Bay is a tough assignment for any RB right now and with Murray and Freeman starting against Oakland and New Orleans respectively it would be foolish to sit them for Riddick. But with a few tasty matchups in the near future, and Abdullah out for at least 8 weeks, picking up the explosive Riddick was an opportunity too good to pass up. I'm also looking forward to making a few "Chronicles of Riddick" puns when he has some breakout games later this year, don't let me down Theo! 34.5 points a week. That is the average that they are giving up and it is just not sustainable as a defence. On paper they came into this season as one of the stronger units, they made key additions and should have helped to push the Raiders into playoff contention. Del Rio needs to figure out how to fix this and fast, otherwise all of the good work the offence are doing will go to waste. It may take a gutsy call or two but thankfully the Raiders have Del Rio in charge and he isn't afraid to make the big call. With 20 odd defences still available in our league I don't need to worry about struggling to pick these guys back up if they turn it around. Bread man is back! 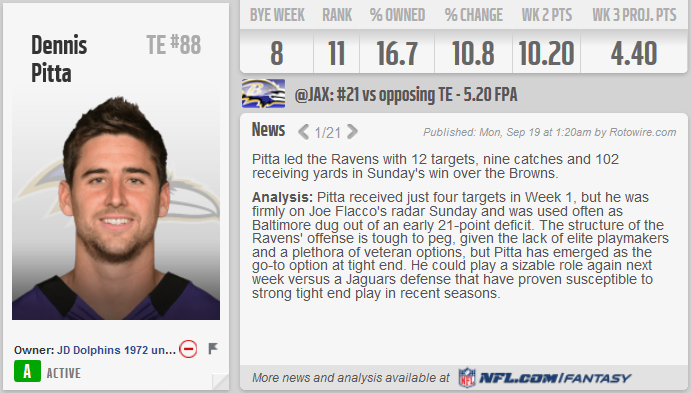 After missing two seasons last week was a blast from the past for Pitta and Flacco. 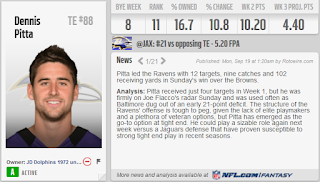 Ben Watson is done for the year and that makes Pitta TE numero uno in Baltimore, and let's face it Flacco doesn't have a wealth of receiving options to go to. The Jags are tough on TEs so this may be another pickup for the future but I like the fact that I can now chop and change the TE position. I carried Barnidge through two weeks, now if something goes wrong at the TE position I can't blame the lack of options. You struggled to get anything going against the Cleveland Browns. THE BROWNS! You may be the self proclaimed number one back in Baltimore but your lack of production through two weeks means that you're off the team in my fantasy league. With Riddick available, and Doug Martin only out for a few weeks, this was an easy move to make. Week three sees my Dolphins take on the 1pt21 JJ Watts team, top scorers in week two. 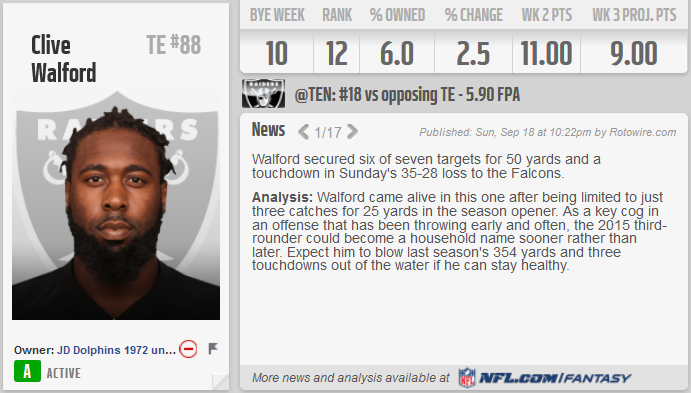 This is a big test for my team with the Watts boasting a number of big name players who could be set to have big weeks. Leading the way are Aaron Rodgers and LeGarrette Blount, Dez Bryant could finally get things going against Chicago while Stefon Diggs will be chasing another 100 yard receiving game. 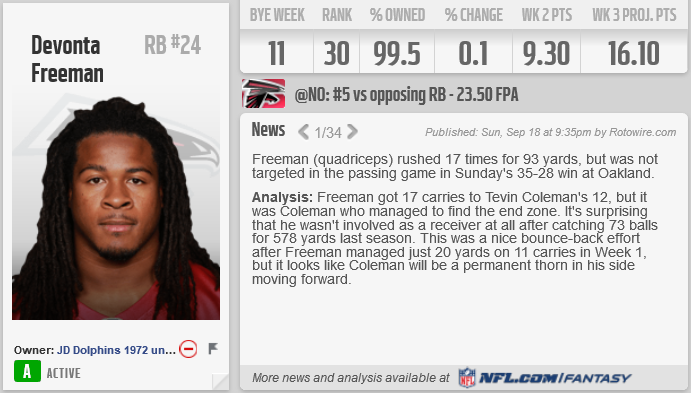 He hasn't failed me in the first two weeks of the season and I don't really see how I can drop him in week three. Tennessee have done well against the QBs they have faced so far this season, but they haven't faced an offence quite like the Raiders yet. Cooper, Crabtree, Murray, Walford... the list goes on (11 different receivers in all), there isn't just one person that the Titans need to shut down if they want to have a chance against this Raiders team. 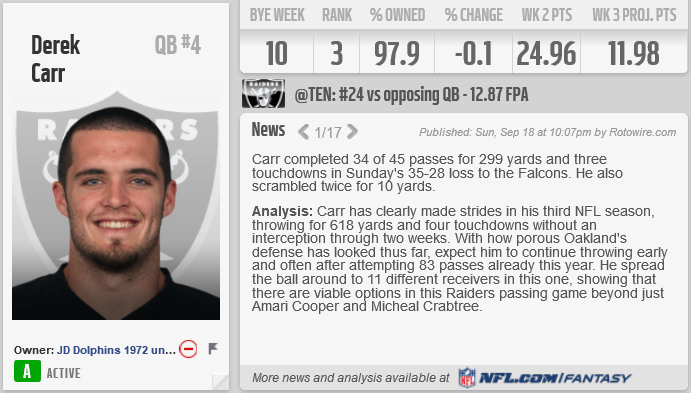 Averaging 31.5 points a game the Raiders should cause Tennessee problems and Carr will be at the heart of that. It is also worth noting that Carr is yet to throw an INT, while racking up 600+ yards and 4 TDs. Murray faces the tissue paper Oakland defence and Freeman faces the patchwork Saints, on paper both should have big days. 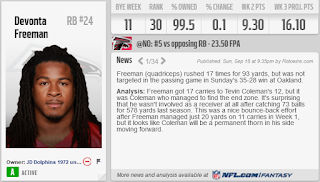 Freeman will have to share time with Coleman but he is still getting more snaps than his teammate, hopefully a strong start against the Saints will see him get the ball well and truly rolling for this season. DeMarco Murray slowed down a bit in week two, but still put up more than enough points to keep his place in the starting lineup, especially considering Doug Martin is out for a few weeks. This matchup could easily see the all purpose RB put up 20+ points, he can run, he can catch and he is on the comeback trail. Forget what happened in Philly, this revitalised Murray is much more like the Dallas vintage. Travis Benjamin had a game for the ages last week, this week he comes up against a banged up Colts secondary. Danny Woodhead is out for the season, of course Melvin Gordon will be the main beneficiary of that injury, which should mean that Benjamin gets even more passes from Phillip Rivers. Another strong performance should be expected this week. 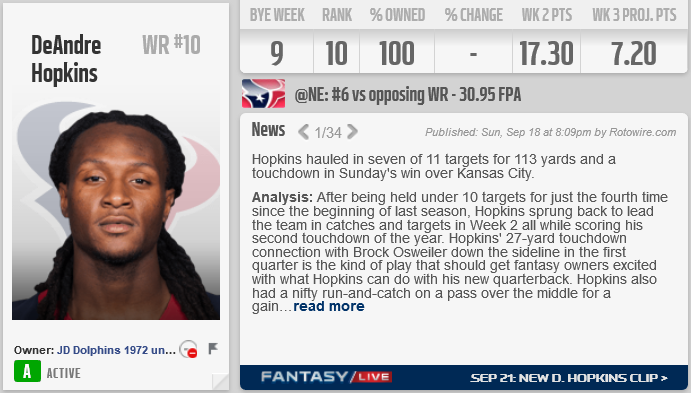 Across from him Nuk Hopkins goes into a tough matchup against the Patriots (edit: this proved to be the case). Belichick is down to his third QB on the other side of the ball so expect to see a lot of run plays and New England eating up the clock. Add to this that Logan Ryan is looking good in that New England secondary and it could be a long day for Hopkins but you can't sit someone like Nuk, it just isn't done. Sure he isn't Carr's main target but his matchup against Tennessee is slightly more favourable than Dennis Pitta against Jacksonville. He should still get a decent number of targets in the high octane Raiders offence and anything more than 3 points will be an improvement on Barnidge. As of writing this Jeffery is still the pick for the flex position despite being limited in practice on Wednesday and this will have to be monitored going into the weekend (edit: Thursday he did not practice which is a concern going into the Dallas matchup on Sunday). With Cutler out injured Jeffery's production will take a knock but he is probably still ahead of Matthews and Crabtree for the role. Matthews' problem is that he has only caught around 50% of passes thrown his way, but he has established himself as Wentz's favourite target. Crabtree is having to share the ball with A LOT (11 different receivers remember?) of teammates, he is a big red zone target with a TD and 2pt conversion but he needs to see more of the ball to remain in contention for fantasy starts. If Jeffery does miss the game it will be difficult to generate points from this position. A top 5 kicker so far this season, Santos can be expected to deliver again against the Jets. New York look like they can give up a lot of points every week which should be good for Santos in the extra points and field goal categories. Kansa City will want to kick start their offence this week after managing only 4 FGs last week. With Oakland's defence gone the Rams are my only option this week, not that I am overly concerned by that. After the horror show in San Francisco they returned to LA and looked much more like themselves. This week they travel to Tampa where they will face the Buccaneers without number one back Doug Martin and Jameis Winston coming off the back of a 4 INT game. If the LA offence can get Gurley going early and Keenum can manage the game from the QB position then this should be a good matchup for the Rams defence. Winston likes to throw the ball in tight windows and with the pressure that the Rams front seven can generate he could be hurried into some bad decisions for the second week in a row. This is set to be the toughest matchup so far for my Dolphins but I am confident that the players at my disposal should give my opponent a run for their money.